15 1/4 x 9 1/4 x 4 in. Carlos Santiago Arroyo, a social worker, tends to the hearts and minds in the community; his art - the carving of santos - speaks to the soul. Santos, literally "saints" in Spanish, represent a centuries-old tradition of religious devotion practiced by Latino artisans. Historically, carvers made these small wooden carvings of religious figures for prayer in the home. As the artist notes, "Although it's true that santos today have more weight as cultural objects than as religious ones on the island, many believers seek the support of these celestial beings to intercede for them today the same way our ancestors did." This santo symbolizes the all powerful hand of Christ. 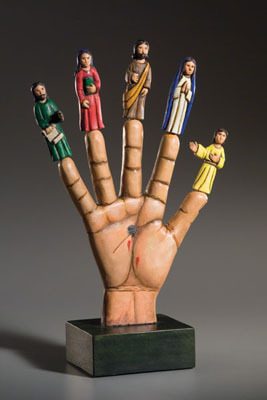 Members of the Holy Family are perched on its fingertips.